Hey. You. Yeah, you. You looking for a Sloto Cash Promo Code? Well, look no further! You know we got your back! Sloto Cash Casino is an online casino gambling site featuring slots, specialty games, table games, blackjack games, video poker, and keno. It is easy to sign up with major credit cards. Sloto Cash Casino offers promotions and bonuses for signing up, reloading your account up to five times, and referring other users. 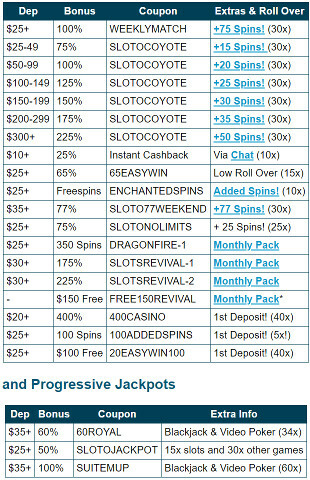 The welcome bonus over at Sloto Cash is 200% on your first deposit. But they also give a reload deposit on your next five deposits. You can also find some free spins available when you sign up and deposit using our link and promo code. The site is very mobile friendly and has customer service representatives available via email, telephone, or chat. 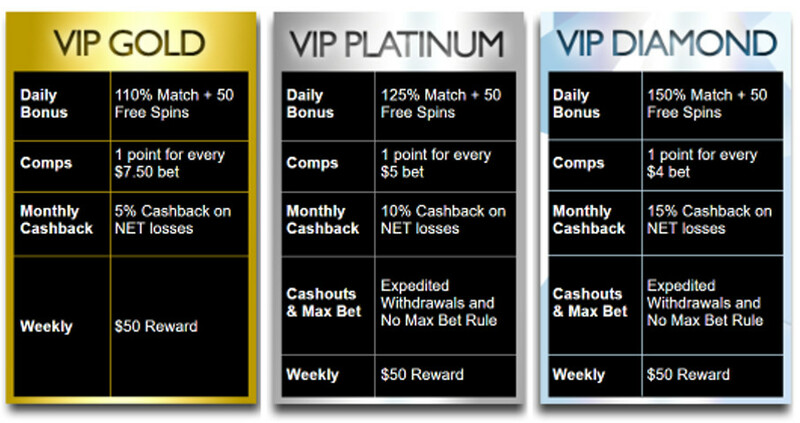 Let’s take a closer look at the bonuses and promotions to see how they compare with other online casinos. That’s right. 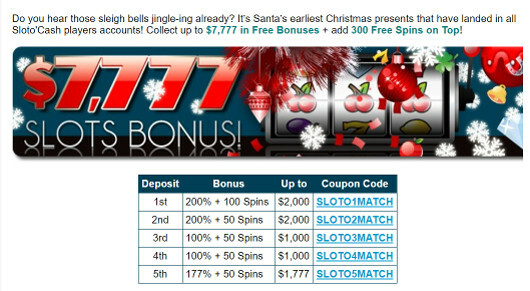 With this one, you could claim up to $7,777 as bonus money for the slots. For this, you would need to make a total of 5 deposits using the following codes. All of these free spins are pretty nice but they must be used on the game “Swindle all the Way” and there is a 25x playthrough requirement. Come play a wide assortment of all-time classic casino games including: Blackjack, Video Poker, Rummy, Three-Card Poker, Pai-Gow and much more! Some people just don’t like the requirements attached to bonuses. That’s okay! If you can go without them you can choose a 25% Instant Cash Back on any deposit made Monday, Tuesday or Wednesday. Make that deposit on any other day and claim 35% Cash Back. If you bust a deposit, (it happens to the best of us), simply log into their Live Chat and get some of your money back. Your account must have NO BALANCE in order to be eligible for the cashback bonus. Lots and lots of codes here for what they like to call their, “Daily Promotions”. First, we’ll show off the ones for the Slots, Keno and Scratch Cards, then we’ll discuss the others. Some pretty good ones up there. As said way above, some of those are identical but do different things, so just make sure you are in fact claiming the one you want to take advantage of! And now for the people who would like some Casino Games as well as some Progressive Jackpots! And again, some pretty good deals going on. Good Luck!! 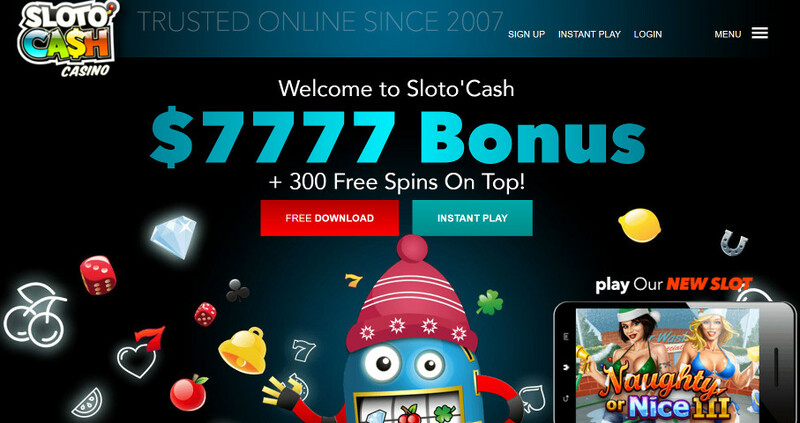 Sloto Cash Casino automatically enrolls you into their comps program upon your first deposit. With every game you play and every wager you make, you earn comps which can be turned into cash once you accumulate enough. 100 comp points equals $1. It is important to sign up for the VIP program though as this will get comps at a higher rate and allow you to accumulate even more. 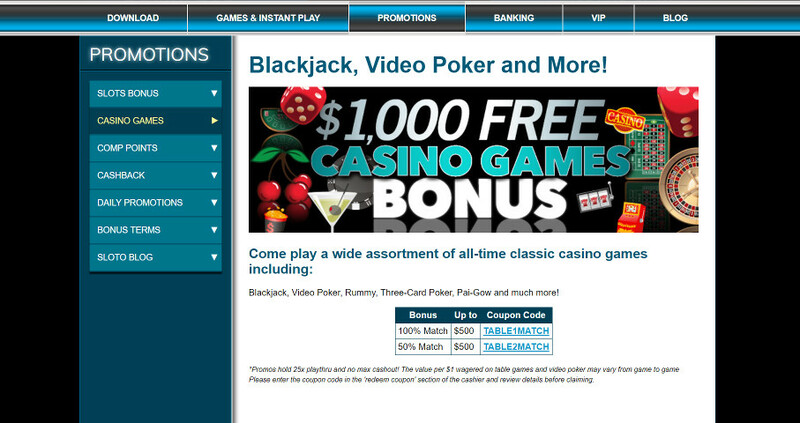 Compared to other top online casinos, Sloto Cash Casino just kind of blends into the crowd. They don’t have as many games. The site looks okay but it’s still too cartoony to be taken really seriously. There are plenty of bonuses and promotions to take advantage of on a positive note. We have other online casinos we like better than Sloto Cash, but if you are looking for a new place to play and some welcome bonuses — sign up and start here.